Introductions and background to this build thread are here Introduction. 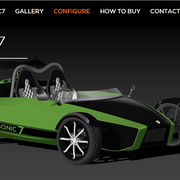 This page is intended to document our Sonic 7 build as the kit is now finally ordered with equilibrium . This is basically what it will look like. 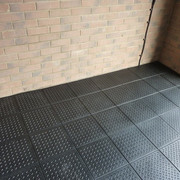 An unexpected first task was to clear out the garage and put some rubber matting flooring down, as it was mispriced in Homebase This will be much more comfortable for kneeling on, and help reduce any dampness from the concrete floor. We have made a trolley to move/support the engine during the build. Before dismantling the focus, I had a mobile Air con guy remove the R-134a gas from the system, so it didn't leak into the atmosphere. Today after a frustrating 4 days of rain and drizzle, and after 6 months of sitting in the drive, we actually started taking the Focus apart to save the parts required for the build. Its happening in the drive to make it easier to dispose of the shell, and the garage is where all the removed parts are being stored. Made some good progress, it might seem slow to some, but Mikey is learning and has done most of the work so far under supervision. 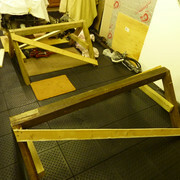 If the weather is try tomorrow then further work is planned. 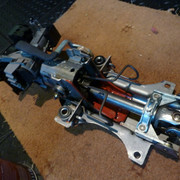 Tackled removing the front suspension and drive shafts today as fantastic weather for end of October for a change. This took longer than expected due to rust, poor technique and lack of brute force. As a note for future reference this area required a few odd tools that I initially didn't have in my collection. 32mm socket for the driveshaft nuts. 7mm allen key for the caliper slider bolts. 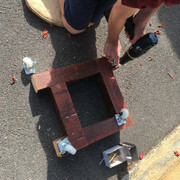 Until I managed to borrow a hub puller, we did manage to get one side moving by improvising, but bending a set of g-cramps, but the proper tool made the job so much easier. All removed, nearly ready for the engine/gearbox removal, except one nut on the exhaust joint has rounded so will have to be ground off first. 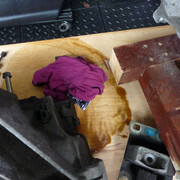 The spilt gearbox oil doesn't look too healthy but will benefit from a flush and change. The removed front hubs will need to be professionally pressed out of the knuckles. 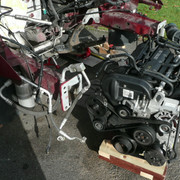 Engine and gearbox successfully removed today. Managed without the need of a hoist. Lowered the car onto the trolley and blocks of wood. 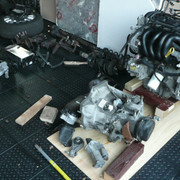 Then jacked up the chassis and slid the engine/box forward. 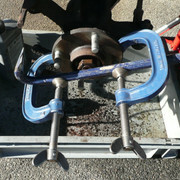 Only then could we finally get a spanner on to remove the final power steering hose from the pump. Parts removed so far are filling up the garage quickly. Final challenge under the bonnet is to remove the engine bay loom, but this looks tricky and the dash will most likely have to come out first? Found some large connectors? 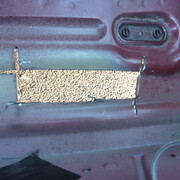 on the bulk head under the passenger wheel arch behind a riveted metal plate which might need further investigation. Update to the last post. 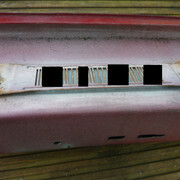 The riveted panel was removed revealing the loom connectors. Once unbolted this easily allowed one part of the engine bay loom to be removed. 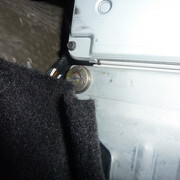 Ford seemed to have madea strange decision here, as one connector only had 2 wires, when there were many free holes in the other connector. 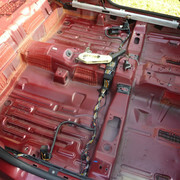 Today's task was to remove the dash to get the wiring/fuse box etc and the gear change cables. Note for future donor based builders, removing the gear change cables is labour expensive as dash brace and the whole heater had to be removed. (possible short cut is to remove the bottom half of the heater only.) This required the air con pipes to be removed which had us stuck over lunch until finding this video. 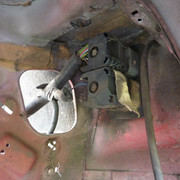 Removing the ECU is proving tricky as the snap off bolt needs to be removed to allow the connector cage to be removed before the ECU will slide down out of its bracket. Haynes says to drill it out from the nut side, but they have already removed the ecu first? 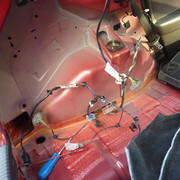 Had a few delays on planned work days, due to wet weather and had to spend one afternoon relabelling all the wiring. Masking tape and pencil is not a good idea even after a few days. Used a brother label printer now so it should be readable in 6months. Bit more progress though today. Finally won the battle with the ECU security bolt. The haynes manual is wrong for this on my 2003. 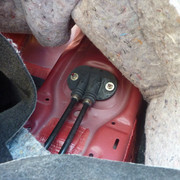 Its says remove the ecu from the holder and drill out the security bolt though the nut side. 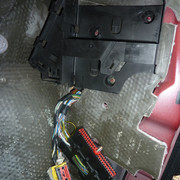 Because of the wiring you can't remove the ecu, so you have to remove the security bolt first. Succeeded with a 2nd pair of mole grips that had sharper teeth than the first. 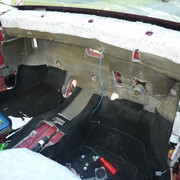 This finally meant that the remaining half of the engine bay loom, and the interior loom could be removed as there are no connectors between this. 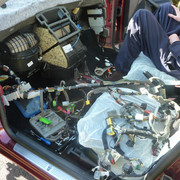 The wiring on the focus is pretty impressive, we have had to take most of the car apart to free it. Although we left all the door wiring, as won't need any of this. 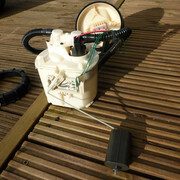 Final part that we need for the Sonic7 is the fuel pump. 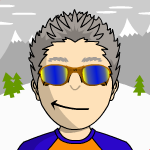 It turns out teenagers are not that "focused" (excuse the pun), they are keen to avoid any tasks that are tedious or unpleasant, so I was left on my own in the cold on this one. A big mistake I made was not running the tank dry or pumping it out when the loom had power. Even though the empty fuel light was on it still holds 1.5 gallons, which is not easy to siphon out through the filler or the supply pipe in the engine bay. The filler pipe jubilee clip is at a really awkward angle to undo, and I was tempted to cut the pipe. Eventually got it removed and got the tank out. 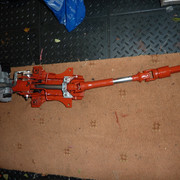 I was hoping have sold some of the remaining parts by now, but as others have reported its not easy selling anything . 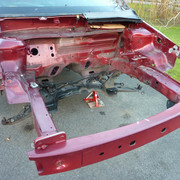 The car actually still looks fairly intact and water tight, so I can at least store the parts inside until crush day. However I don't think the neighbours or the wife will be too pleased having this out the front of the house for much longer. 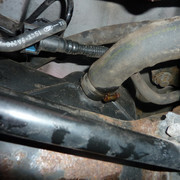 Is it worth saving the donor drum brake handbrake cable? or will I need a new disc brake one? Its only a month since we started when the temp was approx 17deg C. Today it was 7deg C a massive 10 deg drop. Its about from now that working outside, or even in a single skin garage in the UK starts getting unpleasant. All the plastic parts start to get brittle, but luckily not much of this to worry about now the donor is stripped, and aerosol painting is out. 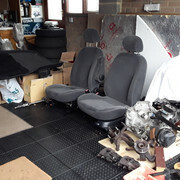 Mikey is ill, so all I could manage to do was to tidy and box up some of the Focus parts and clean up some of the parts to sell in the hope that my clean parts will make them more attractive to someone. Found a perfect place to store the old bumpers until they sell. One of the issues using the 1.6 engine is that the inlet/exhaust manifolds are swapped compared to the 1.8/2.0. This has the advantage that the exhaust heat won't be right behind the seats, but the standard manifold and CAT can't be used as the manifold would stick out the back of the Sonic7 even before the separate CAT or silencer. 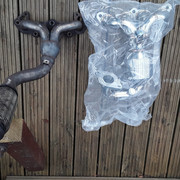 I've found and taken an early gamble (pre kit arrival) on a cheap stainless aftermarket compact Fiesta manifold and sports CAT. This looks like it solves the issues with the benefit of slightly larger ports and a sports CAT so the engine should breath a bit better. 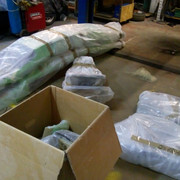 Hopefully there will still be room in the engine bay for a convoluted custom silencer to finish it off. Dump the seats unless they are leather/heated, as they won't sell and will take up huge amounts of space. Not much progress, as its just either too damp or cold or both to persuade a teenager to come away from minecraft so just some bits I've done on my own. 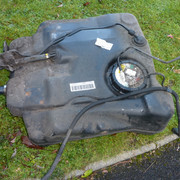 Petrol pump and sender removed from the tank. The Haynes manual talks about making a tool to remove the large plastic nut, but gently tapping a large screw driver will undo it. 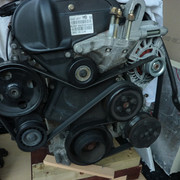 The drive belt layout is complicated on the 1.6 when the donor has power steering and aircon. These will be removed in the sonic so the belt route will change. The air con pump alone weighs over 5kg! Whats this extra pulley section on the crank pully for? just shared with a different engine? Might be worth removing this to save some weight? 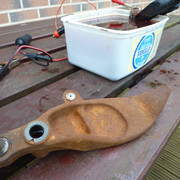 I decided to remove the heavy driveshaft support bracket and try out electrolysis to derust it as reported on other build threads. 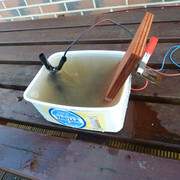 First attempt with an old car battery charger didn't really work due to no amps. Found an old printer power adapter rated at 32V and 1.5A. This is now fizzing nicely. Will update with the result. One of the last remaining jobs on the donor was to remove the chassis number from the windscreen and the drivers footwell so that the scrap yard don't try and declare it as scrapped. I also found a hidden bar code of some sort that might also be the encoded chassis number under the front crash bar. I've removed blocks of it from the photo just in case it is. 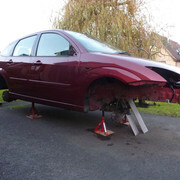 Selling the focus parts is proving impossible with only £40 recovered so far. I now call gumtree, dumtree for obvious reasons, and a load of perfectly good parts will end up just being scrapped. Really amazed with the result from the first electrolysis attempt, and it saves lots of time too. 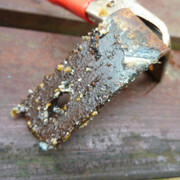 The anode looked a bit of a mess. Above with coat of undercoat and then moved on to the next piece. 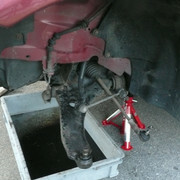 While removing this from the gearbox, I forgot it still had half its oil in it as it doesn't have a proper drain plug. Oops. In my rush to get a coat of undercoat on the second piece I forgot to take a picture in between. 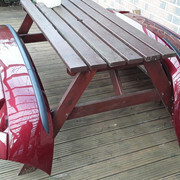 Managed to sell the Focus front wings too, so a good day in all. Last Edit: Jan 1, 2018 21:07:47 GMT by buildityourself: donor update. A few minor updates, but nothing too exciting I'm afraid. Sold a number of front focus parts today to someone who had crashed his wifes car! This was great as only one person to deal with, but I did give a discount as buying multiple bits. Its the same colour so I think we were both happy. Can imagine that the neighbours are getting a bit annoyed now though as its been there for 2 months now. Had a few problems with new part orders though from fleabay. 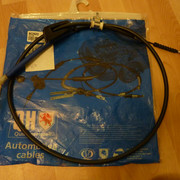 A new packaged disc handbrake cable arrived as below. Its a dirty used? cable with one side completely missing! So thats gone back. 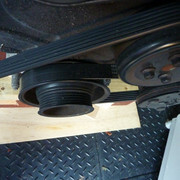 A new gates tensioner for the drive belt seems to have over 1mm of play in the pulley. Also got a new radiator and electric fan, as my focus air con version is mint but too big. 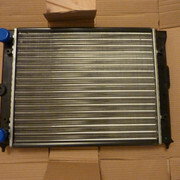 The new radiator is a polo one (popular for kit cars such as other 7 kits). Its quite a bit smaller that the focus one, but has a double core compared to the focus single core. Seems to be very well made and packaged. Bargain price too. I'm hoping to mount this in front of the chassis as others have done, as the equilibrium kit has the fuel tank at the front. 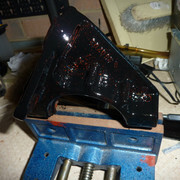 Undercoated the steering column which has no paint at all in the focus. In the Sonic7 this would rust very quickly in the open. 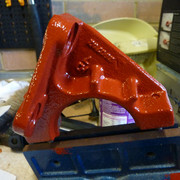 This is a tricky piece to paint as its riveted together and has moving parts. 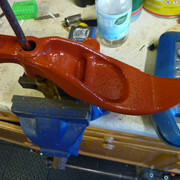 Applied first topcoat to the previous parts that were undercoated. The topcoat doesn't seem to adhere to the undercoat very well. Both paints were different but known brands. The undercoat was white spirit based, but the topcoat solvent thinner based. Would this cause this? Have others had similar issues? I'm hoping another coat will sort it out, but the longer term effect is unknown. 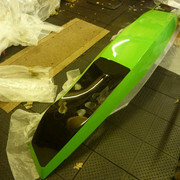 Kit expected at the end of this month, but does not leave much time to find space for it in the garage. I think I will be having to clear up already like perthwa, as in the UK a chassis outside is out of the question. Bit of a fail today. 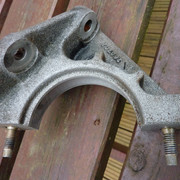 Went to a large scrap yard to get a Mondeo gear stick and Focus rear brake caliper carriers. Found two perfect cars, but on the Mondeo the 4 headless bolts for the gearstick seem to be bolted from underneath the car preventing removal. Really? 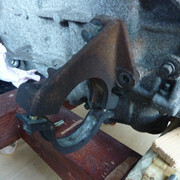 After finding a jack and removing the wheels from a Focus, I managed to round off the first bolt on the caliper carrier. It was pouring with rain and 4deg Celcuis, so I gave up and came away empty handed. Time for some proper 6 sided sockets instead of rubbish 12 sided ones. Today was spent finding random homes for the focus parts in the garage. At this point I'm starting to forgot what some of the parts are or how they connected. Only buy things when you are ready for them. Take photos even if it is obvious at the time. When you remove the parts in context of the Focus its easy, 3 months later in boxes its not. I made some chassis trestles from left over/old wood that I had so that we won't be working on the floor or low axle stands. 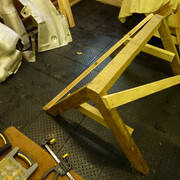 They were quite wobbly until the triangulation braces added but are now very solid. The Sonic7 kit collection is imminent now and the days are starting to get lighter/longer (but still very damp). Roll on spring time! Yesterday was the big day, the Sonic7 kit collection. 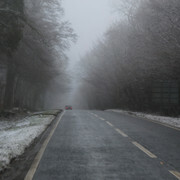 We hired a van and set off early for the Cotswolds, and encountered snow on the way! Angus from equilibrium was waiting for us with tea and biscuits when we arrived to see the chassis and body panels for the first time. You will need a LWB Jumbo Transit or similiar. 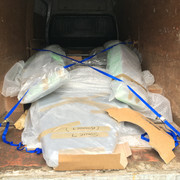 Take large sheets of cardboard for the floor and some extra bubble wrap as hire vans are used for building work! Take 4 ratchet straps to secure the load. 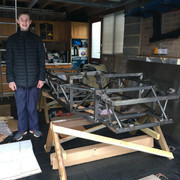 Chassis in its new home with enthusiastic teenager. Good to see you today Stu. Have fun with the build. 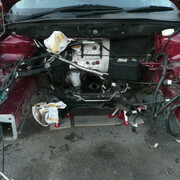 2.0 Zetec, Jenvey throttle bodies, M-tech V4 ECU.